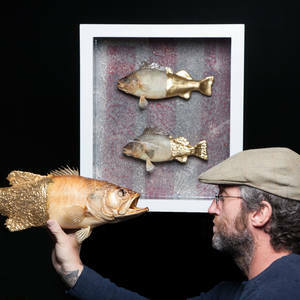 Paul Broomfield is a taxidermy assemblage artist who seeks out vintage and found objects to create his work. Born in the fishing village of Emsworth, Hampshire in 1969, Paul's interest and fascination in the ocean and natural history, taxidermy and curiosities grew from an early age. One of his greatest influences was his grandfather who was an eel fisherman and painter. Trained as a cabinet maker, Paul began a carving & gilding apprenticeship with David Goodman, the fine art framer and paintings conservator - framing art works for the Tate Gallery, the V&A and the National Gallery. Paul worked as a freelance conservator for the National Trust and English Heritage for ten years before moving to France where he spent several years sourcing unusual antique objects at markets & brocantes, selling to clients in England and now using in his art. Returning from France in 2007 Paul now lives and works in North Devon near the sea, surfing, collecting vintage surfboards and fishing. He is passionate about wildlife & our environment. Contemporary Vanitas - Lights of Soho gallery London - May 26 to June 18 2016 - curated by Lee Sharrock Director of Global Creative PR for Saatchi & Saatchi Worldwide. Broomhill Art Hotel, Muddiford, North Devon - 2016 ongoing. Cruel & Curious (3rd year of selection) - with the National Trust Cornwall and Hickory Nines at Stowe Barton - September 23 & 24 2016.